Externally, the upper and lower receiver are CNC aluminum. That metal gives you a super-aggressive billet-style look and makes sure both receivers match up perfectly. Clever design and innovation show throughout this gun. The handguard was custom designed in-house by members of Classic Army USA. The new Ambidextrous charging handle adds functionality to the exterior, allowing you to access your hopup with either hand. Rounding out the externals are the new suppressor ready flash hider (which can fit the Classic Army Fast Attack suppressor) and the B.A.S. Stock. This new stock has the best storage of any telescoping stock on the market, allowing you to fit as many as three separate batteries with room to spare! 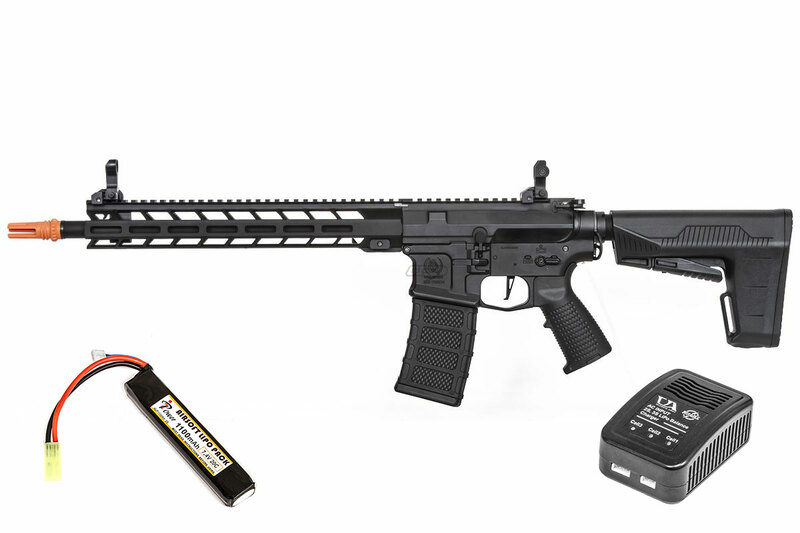 Internally, the gun has a 9mm bearing bushing gearbox, a brand-new electronic control system, or ECS, a 6.03mm tight-bore barrel for enhanced accuracy, a 31k high speed / high torque motor and a TRUE quick-change spring system. The ECS protects your trigger contacts and has a trigger-programmable three- or five-round burst-fire function. It will shoot 375-400 fps using 0.20g BBs and 900-1000 rpm using a 7.4V battery thanks to it's updated 18:1 gear ratio. Combined with the new motor it can provide up to 26 rounds per second, making it one of the fastest AEG's on the market today. It has a true quick-change spring system you can access without having to take out the gear box, saving you precious time so you can quickly and easily upgrade or downgrade your spring to change the power level to adjust to any environment. From an experienced player's point of view, the Nemesis LX-13 is right at home in every airsoft environment. Its compact size means a small spring swap will put you in CQB range. The gun's upgraded internal parts, like a tight-bore barrel and the ECS system, will give you unparalleled trigger response and accuracy. Its futuristic design means you'll stand out from the sea of basic M4s and AKs. Be prepared for plenty of comments and questions when you bring this beast on to the field. 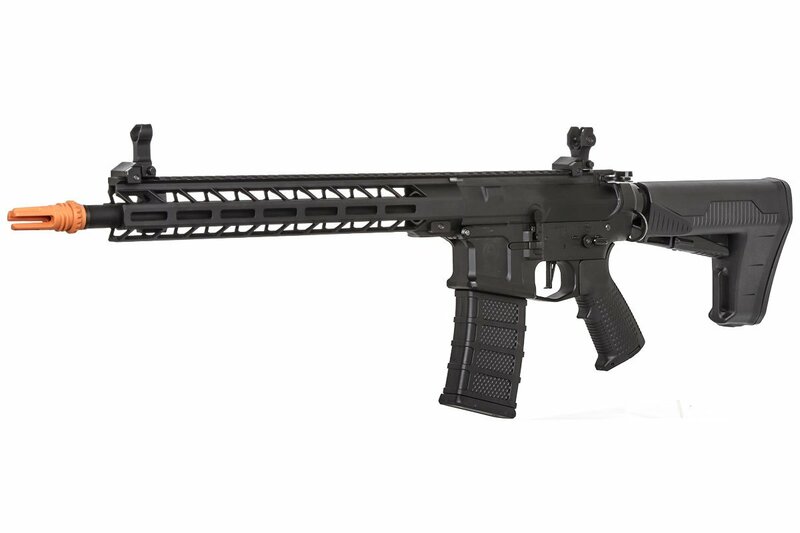 The LX-13 features a very forward-thinking MLOK handguard, allowing for a wide range of possibilities. You can attach many accessories directly to the gun, saving weight by taking the Picatinny rail out of the equation. But if you have older accessories designed for Picatinny rails, you can still utilize them by attaching a small rail piece via the MLOK attachment points. This means that sweet vertical grip you're dying to use and your old scout mount for your flashlight will still attach and still look awesome. This gun is screaming for a red dot with a flip-to-side magnifier. On this gun, your optics become every bit as versatile as the gun itself. Where this gun shines is in outdoor play. Much like its cousins in the rest of the Nemesis line, the LX-13 hits hard and far, meaning you'll get the most out of it in situations where you need to shoot a long way. But it has a very compact stock, meaning that if you tune your spring down, you can easily wield this in CQB with no issues. The texturing on the pistol grip ensures you have maximum control in every environment, with or without gloves. Indoors or outdoors, this gun will make sure you obliterate the competition.